Fish tanks are messy by nature, using an aquarium vacuum as part of the regular maintenance can greatly improve the water quality and ensure the tank is a safe environment for fish and live plants. A gravel vacuum makes it possible to remove debris, such as fish or plant waste and uneaten food from an aquarium. Fish tank filters, specifically filters equipped with mechanical filtration, already work to remove debris from tanks. A fish tank vacuum is another line of defense in maintaining a clean and healthy tank. Utilizing an aquarium vacuum cleaner reduces the strain on a filter, and can extend the life and usefulness of filter media. Increasing the effectiveness of filter cartridges or sponges can save time and money, since the media will need to be replaced less often. When heavier materials sink to the bottom of the tank they are beyond the reach of a filter. In this instance a gravel cleaner is the only way to remove these waste materials. The quicker waste is removed from a tank the better. 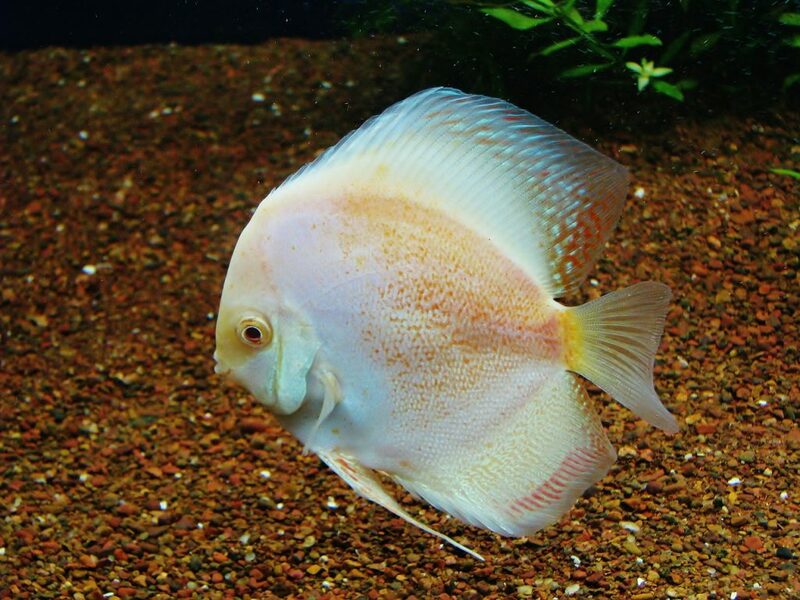 If fish waste accumulates in the tank over time toxins can be released, but a pass with one of the best gravel vacuum can remove harmful material quickly. An aquarium vacuum also makes it possible to clean hard to reach areas of a tank. The placement of plants and decor sometimes create dead spots that a filtration system cannot touch. A gravel cleaner makes it possible to access all areas of a tank. How to use a gravel vacuum is a common question for many first time fish keepers. Fish tank gravel vacuum systems are essentially a tube used to siphon water. Some vacuums feature a pump that makes it possible to begin the siphon action. Water and debris are pulled through a tube or hose and deposited in a bucket or sink. As part of regular maintenance a percentage of the tank water needs to be replaced every so often. An aquarium gravel vacuum makes it easy to remove water, along with a build up of solid waste. When a more thorough cleaning is necessary a siphon makes it possible to drain all of the water from a tank. Draining the water and starting over with clean water is a necessary part of maintaining a healthy aquarium. Many aquarium siphon systems can be used in reverse to fill a tank. Clean water can be siphoned from buckets into the aquarium. There are even models that attach directly to a sink faucet, making it incredibly easy to fill a tank. Gravel vacuum systems can be tricky to operate, and it takes some practice to get the hang of it. It generally works best to keep the vacuum tube straight and make steady movements. Quick or sudden movements can impact the suction and debris may fall out of the tube. It is important to work quickly when cleaning the tank, because along with dirt and debris, water is also being removed. If the goal is to clean the tank and just remove some water, you do not want to over do it or potentially drain the tank. The objective is to just remove debris, and not disrupt the habitat or aquascaping. It is more than likely that at some point gravel will be pulled into the vacuum tube by mistake. Gravel in the system can potentially scratch or damage the hose or cause a clog. Pay special care to avoid harming or pulling fish into the system when operating a fish tank gravel vacuum. Many fish tank cleaner systems come with variable lengths of tubing. Measure the space from your tank to the location where you will place the catch bucket, or the drain you intend to use in order to determine the system that is the best fit for your space. Keep in mind that the vacuum tube needs to reach the bottom of the aquarium, and it is a good idea to factor in some extra length for slack. For some aquarium gravel vacuum systems additional tubing can be purchased to extend the reach in case the distance was miscalculated, or if a tank is moved. The TERAPUMP Aquarium Cleaner Siphon Pump features a very simple design that is proven to efficiently wash gravel. 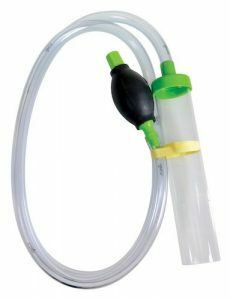 The hand pump makes it easy to pull water into the tube and begin a siphon. Two types of nozzles allow for customized use. A shorter nozzle is intended for drainage. The short nozzle features a built-in filter that ensures the water moved into a tank is clean and free of any debris. The included longer nozzle is easier to reach to the bottom of a tank, making it best for vacuuming gravel. 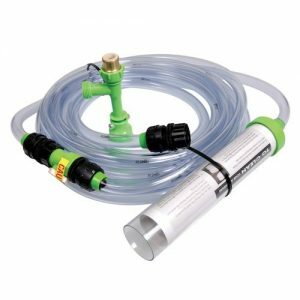 The longer nozzle also features a built-in filter that allows waste and debris to pass through, but prevents gravel and small fish from being pulled into the housing while cleaning. 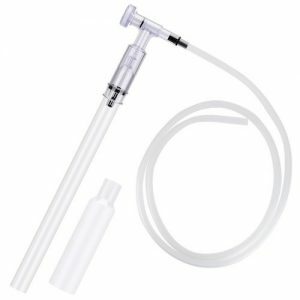 When draining or filling a tank this siphon pump can be used to move water, preventing the hassle and potential mess of scooping water out of or into the tank and lifting heavy buckets. A built-in suction cup allows the tube to be connected to the inside wall of the tank when in use. This keeps the unit in place and makes it possible to operate the pump with one hand, while preventing any messes or spills. This aquarium cleaner and siphon pump moves a lot of water quickly. The water flow control makes it possible to adjust the flow of water to a degree, but the water still moves pretty fast. This cleaner siphon is almost too effective at moving water to be used as a gravel vacuum in small tanks, because the tank will drain very quickly. It is better suited to draining tanks, or to vacuum large tanks. The Python Gravel Vacuum is easy to set up and makes routine tank maintenance quick and simple. 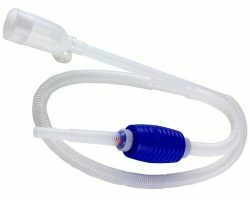 What sets this aquarium cleaner apart from many of the other fish tank vacuum systems available, is that this model comes with variable length tubing and a faucet adapter. To use this gravel cleaner the faucet adapter must first be attached to a sink. When emptying or cleaning a tank water flows through the tube and directly drains into the sink. When filling a tank water flows from the faucet straight into the tank. There is a valve on the end that goes into the tank to start or stop the flow of water. The Python No Spill Clean and Fill system eliminates the need to fill and carry buckets to and from the tank. The integrated faucet pump greatly simplifies the process of setting up a siphon. This setup eliminates messes and saves time. The tubing comes in lengths of 25, 50, 75, and 100 feet. You just need to determine the distance from your tank to the sink you intend to use and purchase the nearest size that will allow enough slack. The hard plastic gravel tube is ideal for cleaning the tank and vacuuming solid waste. The gravel tube comes in a range of sizes to fit the depth of just about any tank (additional gravel tubes sold separately). This kit also includes a switch, hose connectors, and a brass faucet adapter. This vacuum is intended to fit most standard size faucets, but it does not fit all faucets. In some instances it may be necessary to purchase an adapter to attach the setup to your sink. The soft tubing can easily become tangled and develop kinks. In order for water to flow through the tube it needs to be straightened out with no bends. 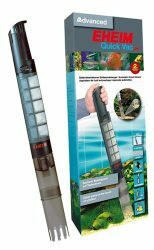 Wash and siphon aquarium water without the hassle with the KEDSUM Aquarium Gravel Vacuum Siphon. This unit is intended for fish tanks that range from 50 gallons to 100 gallons, with a depth of 11.8” up to 23.6”. This model can be used to vacuum gravel, or empty a fish tank of water. When filling a tank you can use this item to siphon clean water from a bucket into a tank. An integrated strainer in the inlet catches debris from entering the tank, and prevents fish and sand from being pulled out of the aquarium, depending on the direction of the siphon. This automatic gravel vacuum can handle a maximum flow of 2.11 gallons per minute, so a large tank can be drained or filled in no time. Adjustable flow control makes it possible to slow down the movement. This feature is ideal when using this device to vacuum gravel, since you just want to clean the tank while removing a limited amount of water. For added functionality, this gravel vacuum has a sand cleaning feature. Sand can be washed to remove waste and toxins, creating a safe fish habitat. This gravel vacuum is difficult to use in small tanks due to the 14” rigid intake filter tube. In order to get the siphon started there must be water in the intake tube, but in a small tank it is difficult to get the angle right to start the siphon. On the other hand, at 14” the intake tube is too short for use in larger, deeper tanks. The construction is somewhat poor, and the different components sometimes come apart while in use. This aquarium vacuum features the most basic, and still effective, design to clean gravel. 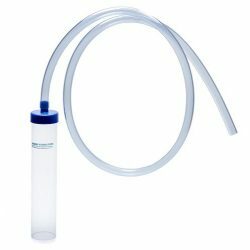 The manual fish tank siphon is made from flexible, high-quality tubing. The hard material of the gravel tube is durable, allowing it to be pressed into the gravel, and it will not chip or crack. A range of sizes support up to 10 gallon tanks, two versions for up to 20 gallon tanks(1-inch diameter and 2-inch diameter), and from 20 to 55 gallon fish tanks. This fish tank vacuum effectively washes gravel and pulls debris from the bottom of a tank. Using a siphon waste materials are removed from the aquarium. This device can also be used to completely drain a tank, either for routine maintenance or when setting up a new aquarium. When cleaning or draining a tank water is moved into a bucket and disposed of from there. When filling a tank the process is performed in reverse. A bucket is filled with clean water, and siphoned from the bucket into the tank. To use the Python Pro-Clean Aquarium Gravel Washer and Siphon Kit the entire device must be submerged in the tank in order to activate the siphon. This can be messy and leads to dripping dirty tank water outside of the tank. The tube is 6 feet long, which may not be enough to still reach a bucket when cleaning a large or deep tank. The length is better suited to smaller tanks. Quickly cleanse a fish tank of waste without the hassle of a siphon, hoses or lugging full buckets of water with the EHEIM Quick Vac Pro Automatic Gravel Cleaner and Sludge Extractor. This battery operated device can run for up to 4 hours on fully charged batteries, and can safely be completely submerged in up to 3 feet of water. Routinely cleaning a tank alleviates the pressure on the filter, helps to clean a tank of debris for a clean fish-friendly environment, and extends the time necessary between changing the water. The powered design allows for quick spot cleaning without all of the setup necessary when using a siphon system. This handheld powered aquarium vacuum is not intended for use with fine sand or gravel. When water is returned to the tank after running through this fish tank vacuum device it can be cloudy. This is caused by small waste particles that are too tiny to be caught in the filter re-entering the tank. The tank filtration system will remove this mess, creating a clean environment. Easily clean aquariums from 10 gallons up to 30 gallons using Dora’s Corner Store Aquarium Gravel Cleaner. The flexible drain hose is effortless to maneuver for ease of use. The hard tube can be firmly pressed into gravel, and when the water is flowing debris will be separated and pulled into the hose and deposited in the waste bucket. This model uses a self-priming valve in the lid to start siphoning water. This gravel cleaner also serves to drain a tank, as well as fill a tank. The 56″ drain hose may come up short when used to clean some tanks, especially large aquariums. It may be necessary to place the waste bucket on a chair or table in order to allow enough slack to reach the bottom of the tank. This aquarium vacuum can be messy to use. In order to start the siphoning action most of the device must be submerged in the tank water. Once this happens dirty tank water can drip outside of the aquarium, and lead to a bigger mess. 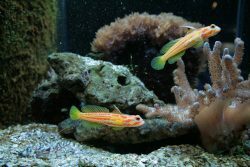 A fish gravel vacuum and fish tank siphon can greatly improve the quality of an aquarium, and reduce the amount of work that goes into maintaining an aquarium. Fish tank filters do a good job of cleaning the water in a tank, but they cannot get everything. 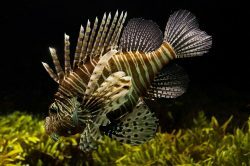 Using a fish tank cleaner in addition to a filter alleviates some of the stress and work placed on the filter, and can make for a cleaner and safer habitat. Siphons can be tricky to operate. It takes some practice and patience to figure it out and make it work. Siphons that attach to a faucet, or feature a hand pump are somewhat easier to operate. Very basic vacuum siphons are the most challenging to use, but once you get the hang of it they are easy to operate. When using a siphon take the time to work on it and learn how to start and maintain a flow of water. Powered aquarium gravel cleaners do away with the hassle of siphons and tubes and buckets, but they are only effective at cleaning the bottom of the tank. This is very useful feature and a necessary part of aquarium maintenance, but powered fish tank cleaners cannot be used to drain or fill a tank. It is still necessary to own a siphon device for that purpose. If a vacuum siphon is used to clean or drain a fish tank it is very important to rinse and clean the siphon in between draining and filling a tank. This will prevent any waste in the hose or stuck in a filter from being re-deposited back into the aquarium. Please comment on this post with feedback, thoughts, questions, or firsthand experiences you would like to share about the best gravel vacuums.